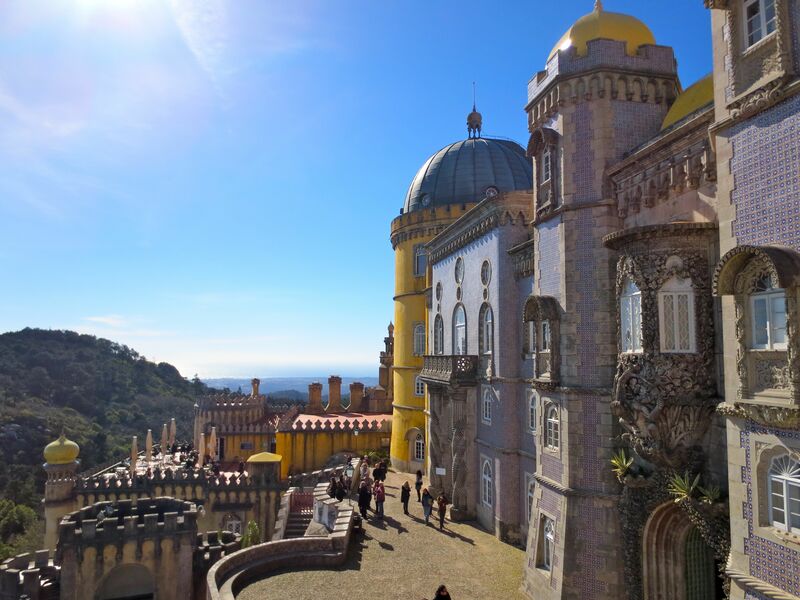 The Palaces of Sintra, Portugal | Where is Yvette? “You must go to Sintra!” everyone tells you the moment they hear you’re going to Lisbon. When even the random Portuguese man on the street is telling you such it’s advisable to do so, so I hopped on the commuter train for the ~40 minute ride out with no serious ideas of what was there except a nice town with a lot of nice summer palaces and estates from the Portuguese royalty and other elite. 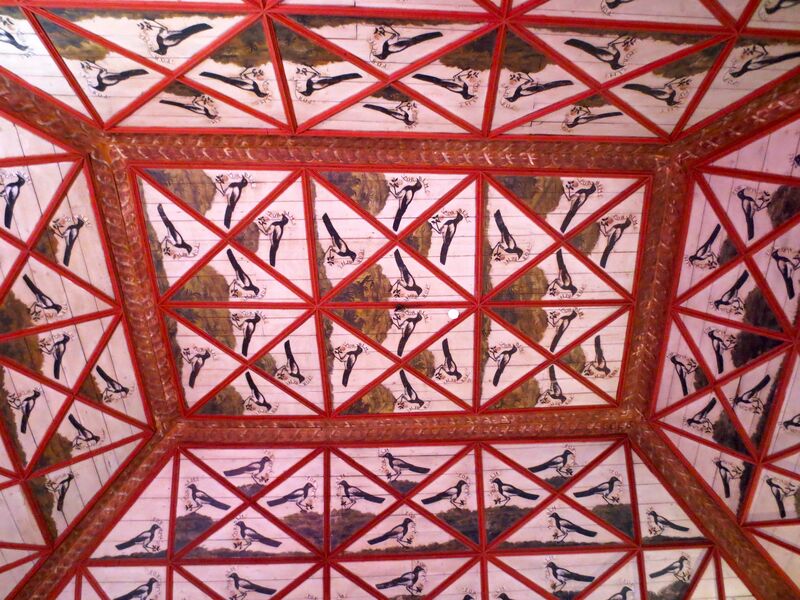 And holy hell, everyone is right- you must go to Sintra! The town is lovely, and the palaces are so wonderful that I think they have my new favorite palace in the world here! The palace in question is the Pena National Palace, perched on the highest hill around with sweeping views of Lisbon to the east and the westernmost point of Europe in the opposite direction. 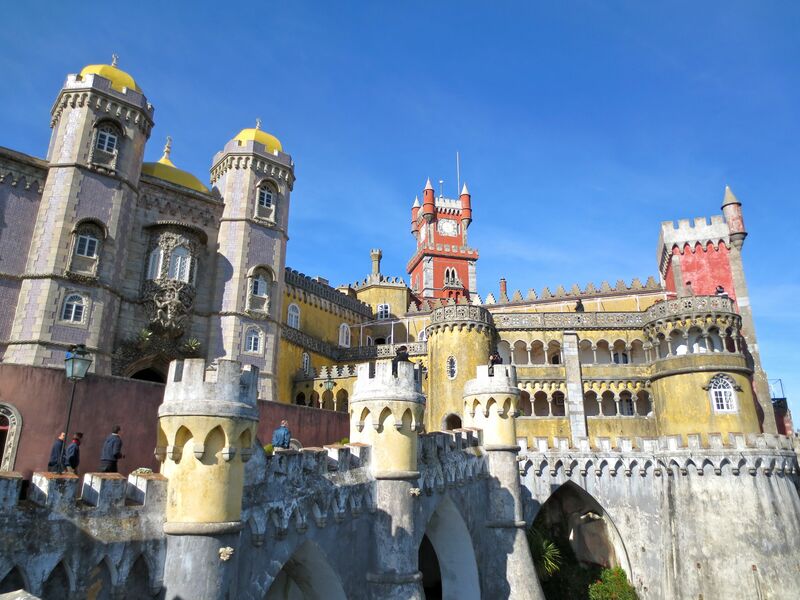 It was built in the 19th century to be the summer resort of the Portuguese monarchy, meaning it’s built in full romantic style like something a child would draw in art class. Meaning it’s totally awesome. The town of Sintra itself is quite nice too- at the bottom of the hill, but chock-full with more palaces and mansions that are palaces in their own right. Smack dab in the middle of town is the Sintra National Palace which was the royal summer residence from the early 14th century to the late 19th century when Pena was constructed. The outside is nowhere near as fantastic but wow, you know how I said Lisbon lacks the grandeur and wealth of the Portuguese crown because it got razed in an earthquake? Well when that happened they rebuilt and restored what was damaged in the Sintra Palace, so you definitely get a taste of what it was like Now I must say, I’ve been to enough palaces in northern Europe by this point to know if I could choose I would definitely be a medieval noble in Portugal over one in, say, Ireland or England. Castles in northern Europe from that time period are certainly interesting but always just leave me with the impression of how cold and dark it must have been- the poor of these countries now lead a more luxurious life- but you don’t get that feeling at all here. 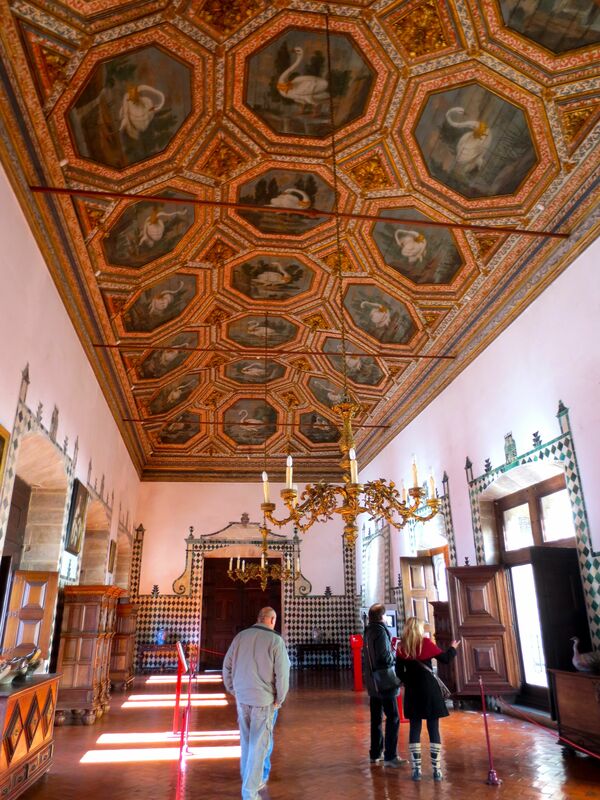 In fact, you get the feeling that if they offered you the keys to Sintra Palace you’d be quite happy to settle down here, so imagine how much more spectacular it must have seemed 500 years ago! Overall I must confess that if I did the Portugal weekend again I would base myself in Sintra with a day going into Lisbon rather than the other way around, as it’s such a nice little town with quite a lot to see. 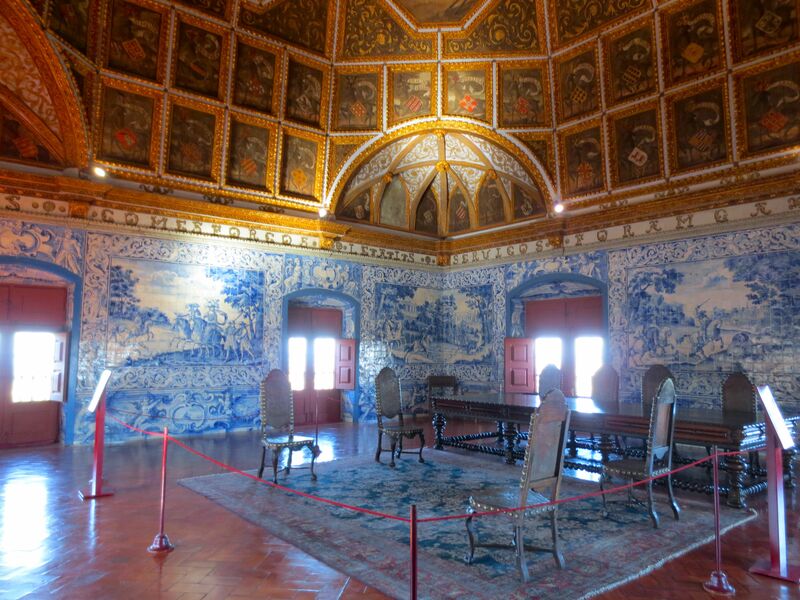 Plus while I know the Portuguese probably wouldn’t let me, it’s quite fun to imagine taking up residence in the palaces. Well, we both have reason to be jealous of each other. I visited Sintra as well, but my tour group skipped the palaces. On the other hand, we made it to Quinta La Regaleira, which I thought was one of the highlights of my entire fortnight in Portugal. Guess I’ll have to go back now…. No really, most of the Quinta La Regaleira grounds were closed as a huge storm had swept through a few days earlier and downed a lot of trees. What can you do eh? Yes, Regaleira is a must-see! 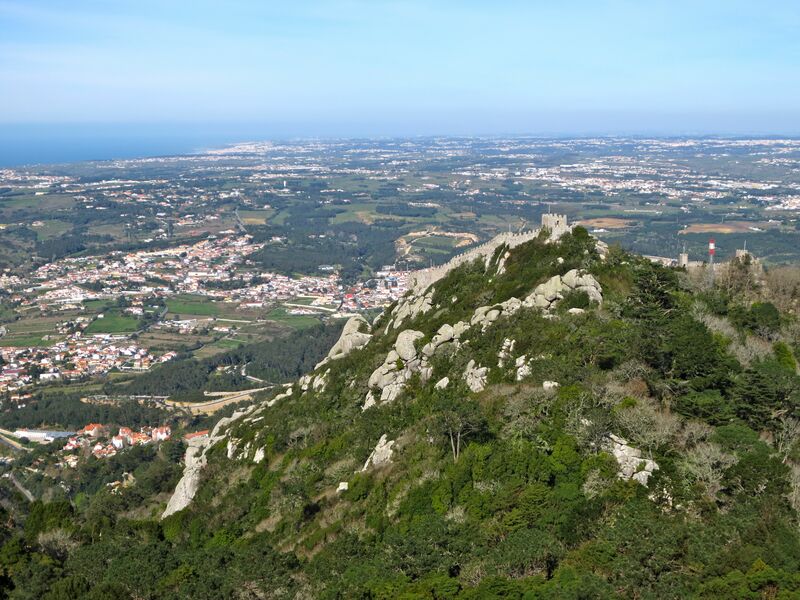 And Sintra has so much to offer besides the palaces… Granted, most of it can only be seen if you have a car! I’m actually planning my summer trip to Portugal at the moment (yes, now already. I just love planning) and I’ll be doing a little road trip from Lisbon up to Coimbra, Porto, Braga, Guimaraes, the Douro Valley and back down to Lisbon with making stops in Obidos and Sintra. – or I first drive to Lisbon to drop off the car and then go to Sintra by train, but as I read it’s better to have a car in Sintra? I’ll be arriving in Lisbon, getting a rental car and immediately heading north, to come back to Lisbon afterwards, making stops at Obidos and Sintra. – go to Sintra by car and spend one night there (but I don’t feel like sleeping at 6 different places during a 2-week trip). Sounds like a good trip and don’t worry, I’m not one to deter others from their planning! If you’re only doing a day in Sintra there *is* a bus system- it does a loop that you can start at the station and goes all the way up the hill with stops at the main sites (ie center of town, the Regaleira, Moorish Castle, and Pena Palace if I recall correctly- I don’t remember the price which means it was reasonable). So I think you can really go either way, but if you’ve already got a car and are heading that way I think you might as well do the first option- if nothing else it save you the 40min train ride. Oh sorry. I hadn’t gotten an ‘awaiting moderation’ message so I thought it got lost somewhere on the World Wide Web:-) Glad to have made the cut though! I also think I’ll go for the first option. Having a car is so easy. You can go from one place to the next whenever you feel like it. Would you see it’s worth spending the night in Sintra, or can everything be seen in a day? I wanted to get to Porto and points north as part of my trip but couldn’t fit it in. I would recommend trying to get to Evora (east of Lisbon) if you can manage it. The place is almost drowning in scenic history: city walls, aqueduct, cathedral, other notable churches, city square, Roman temple. I took a bus day trip there, but it should be an easy drive as it’s just off one of the major highways. I’ve been looking into Evora but thought it might been a little out of route. Maybe we’ll chimp it in if we still have the time. I definitely want to visit Evora, but I don’t know if we will on this trip. I’m planning to go back to Portugal on another trip to see the south, so maybe I’ll combine that with Evora. If you ever get to the south coast, the two must-sees in my book are Tavira and the fortress at Sagres. There are plenty of other places worth going (Sagres, Faro, Lagos), but those were the highlights for me. I’ll run it by Boyfriend, who will be joining me on this trip, but I think I’m going to do the drive down from Porto to Obidos, visit Obidos, then drive to Sintra, spend the night and have the full next day to visit, then maybe stay another night and then drive to Lisbon. Might be easier driving to Lisbon in the morning as well, as we’ll have to go drop off our car at the airport and all.